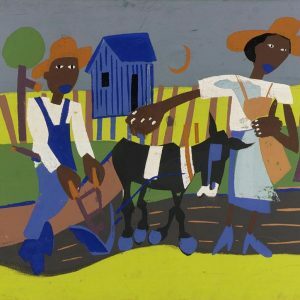 William Henry Johnson (1901-1970), an important painter of the “Harlem Renaissance,” was born a block north of here on Cox Street. In 1918, at the age of 17, Johnson moved to New York City to pursue a career in art, studying at the National Academy of Design and later in Europe. He and his wife, a Danish artist, spent most of the 1930s in Scandinavia, where he was influenced by the folk art tradition, but Florence people and places inspired some of his later works. Several of his paintings are in the permanent collection of the Florence County Museum, 111 W. Cheves St.